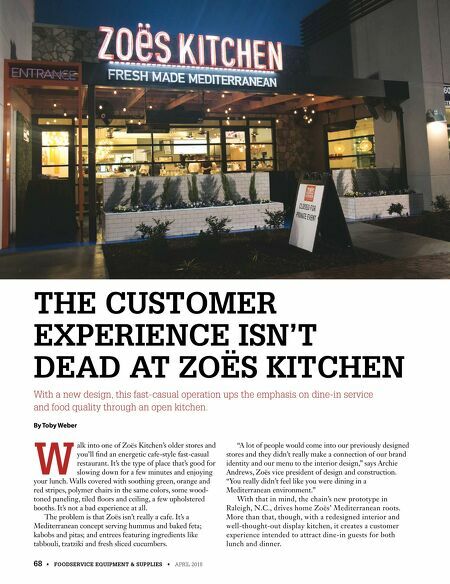 68 • FOODSERVICE EQUIPMENT & SUPPLIES • APRIL 2018 THE CUSTOMER EXPERIENCE ISN'T DEAD AT ZOËS KITCHEN With a new design, this fast-casual operation ups the emphasis on dine-in service and food quality through an open kitchen. 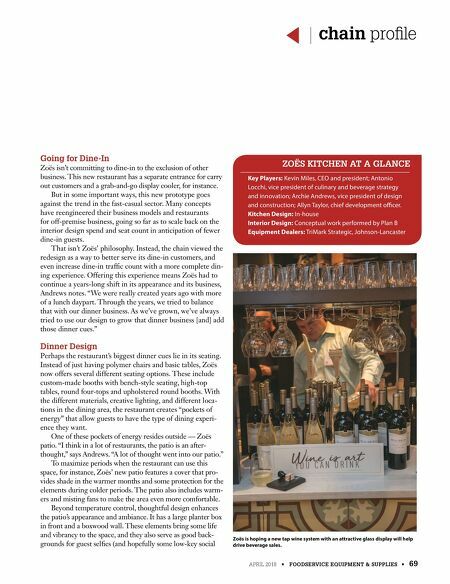 By Toby Weber W alk into one of Zoës Kitchen's older stores and you'll find an energetic cafe-style fast-casual restaurant. It's the type of place that's good for slowing down for a few minutes and enjoying your lunch. Walls covered with soothing green, orange and red stripes, polymer chairs in the same colors, some wood- toned paneling, tiled floors and ceiling, a few upholstered booths. It's not a bad experience at all. The problem is that Zoës isn't really a cafe. It's a Mediterranean concept serving hummus and baked feta; kabobs and pitas; and entrees featuring ingredients like tabbouli, tzatziki and fresh sliced cucumbers. "A lot of people would come into our previously designed stores and they didn't really make a connection of our brand identity and our menu to the interior design," says Archie Andrews, Zoës vice president of design and construction. "You really didn't feel like you were dining in a Mediterranean environment." With that in mind, the chain's new prototype in Raleigh, N.C., drives home Zoës' Mediterranean roots. More than that, though, with a redesigned interior and well-thought-out display kitchen, it creates a customer experience intended to attract dine-in guests for both lunch and dinner.